3) Attending the Florida Writers Association meeting in Lakeland FL this April 16, where I'll be asking about post-meeting for quick hints on self-marketing with a Facebook page perhaps or other methods. So I'm off to work! Just three more chapters to go! ...'cause I really don't need another t-shirt at the moment. Wait, am I just admitting to the possibility I might have an honest-to-God story published somewhere? 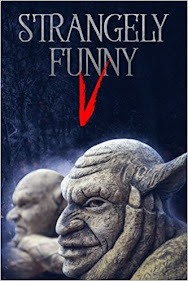 The small-press Mystery and Horror LLC is starting up an anthology collection titled Strangely Funny. They put a call out for submissions, got shared on Facebook, and I gave it a look-see. I'd like to think I'm good at writing humor stories - the handful of comments I get back on my self-published collection Last of the Grapefruit Wars are for the funnier stories I wrote (my absurdist office golf tale is an award winner no less) - so I set myself down, pounded out a tale about a vampire coping with a slayer-wannabe breaking into his home, and submitted it. They were nice enough to send back a Writer's Agreement to secure permission to include that story. Now it's not a 100-percent guarantee it will get printed - if they get better submissions and lack the room I'll understand - and of course the editors can revamp - heh I said vamp - that story as they deem necessary. I'm okay with the editing process just as long as they keep the core component - that Christopher Lee is a badass - of my story intact. Meanwhile, they're still taking submissions for that Strangely Funny anthology. Deadline is June 10th 2013. It wouldn't hurt to submit something, you think? I've added two links to the Bartow Public Library over to the right of this blog. In particular is the link to the Friends group, the volunteers who support the library 24/7 (excepting holidays of course).